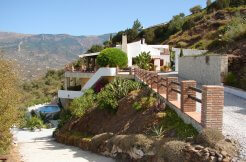 Wonderful bungalow with front garden, large roof terrace and lovely sea views. Spacious layout with 2 bedrooms, shower room, open kitchen (fully equipped) and a bright lounge with air conditioning, fireplace and access to a large, glassed in terrace. Set in a very well kept residential area with beautiful gardens and a communal pool.